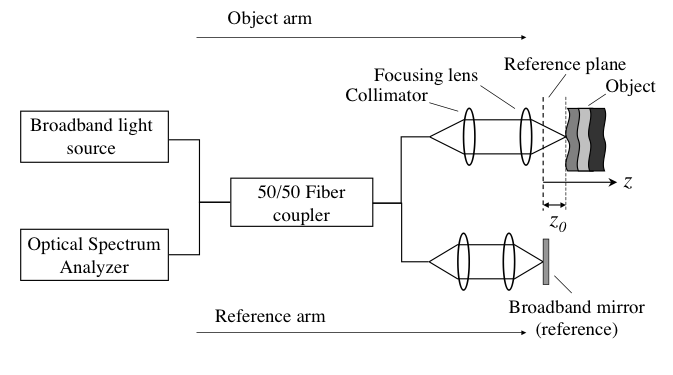 Frequency domain optical coherence tomography (FDOCT) is a new technique that is well-suited for fast imaging of biological specimens as well as non-biological objects. The measurements are in the frequency domain and the objective is to retrieve an artifact-free spatial domain description of the specimen. We develop a new technique for model-based retrieval of spatial domain data from the frequency domain data. We use a piecewise-constant model for the refractive index profile that is suitable for multi-layered specimens. We show that the estimation of the layered structure parameters can be mapped into a harmonic retrieval problem, which enables us to use efficient high-resolution spectrum estimation techniques which require few measurements. We also analyze the effect of additive measurement noise on the algorithm performance. Simulation results show that the technique gives highly accurate parameter estimates. S.C. Sekhar, H. Nazkani, T. Blu, M. Unser, "A New Technique for High-Resolution Frequency Domain Optical Coherence Tomography," Proceedings of the Thirty-Second IEEE International Conference on Acoustics, Speech, and Signal Processing (ICASSP'07), Honolulu HI, USA, April 15-20, 2007, pp. I-425-I-428.